... I am publishing a printed magazine (fanzine) on topics related to the German comic book series Mosaik. The issue coming end of 2017 is intended to be about the American Old West. 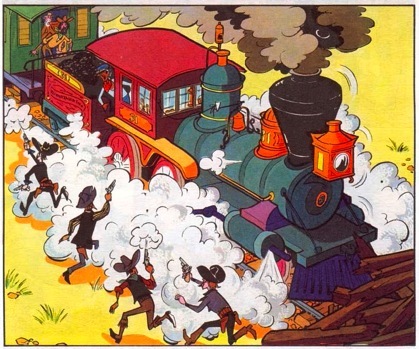 In one of the comic books which has been released 1971, a railroad is shown ... Can you tell me which model it could possibly be (or which model could be similar to the one on the picture)? The artists were often inspired by old photographs or engravings, but since a lot of time has passed since then, they can’t remember now. Unfortunately, all our previous research was unsuccessful, so we hope you can help me. Maybe you can also tell me something about the railway wagon? I would be very glad about an answer; and perhaps it’d even be possible to send an old picture of the engine?